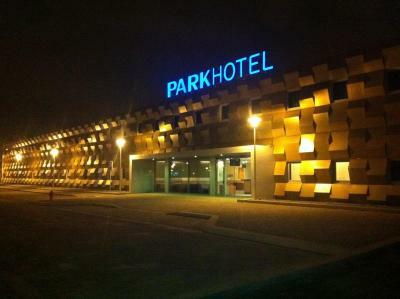 Lock in a great price for Park Hotel Porto Aeroporto – rated 8.5 by recent guests! Great to stay overnight before a trip to the airport. Friendly and helpful staff. It was actually really close to the airport, 9 minutes walking. We arrived late at Porto, around 00:00 and it was easy to reach the hotel by foot. Check in was easy and nice. The room was great, beautiful, clean and comfy. 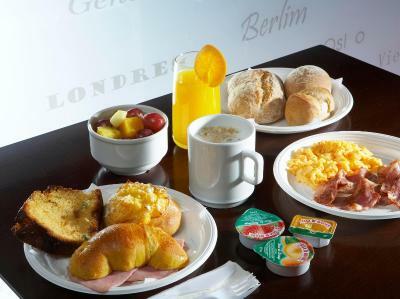 Breakfast was great as well and check out was extremely easy. Great option of hotel. The dining room is a disappointment. 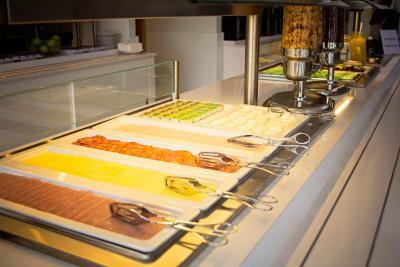 The buffet is too expensive without a lot of choices or variety. I ended up habing a bowl of soup and 1/8 of a sandwich for 8 €. The soup was watered down w little flavor. The lady brought me my soup. Tasted it. It needed more flavor. Asked for salt and pepper and she said it's on the buffet... Basically get it myself. Also 2 tiny pieces of bread that came w the soup were hard and old. This is our second time at the restaurant and the first time was a disappointment as well. We were siting having drinks at a 4 top and the waitress asked us to move to a 2 top when there was Plenty of seating through the restaurant. It made zero sense to us. 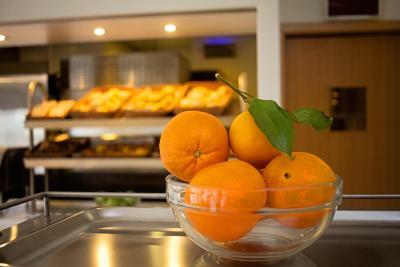 Excellent location, very friendly staff, superb breakfast. The buffet lunch was not really great. 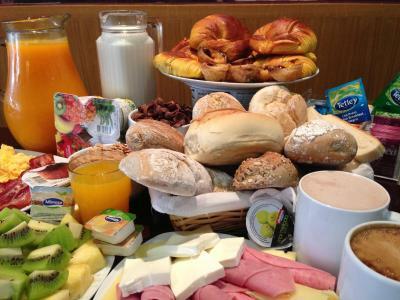 However, the breakfast was amazing! 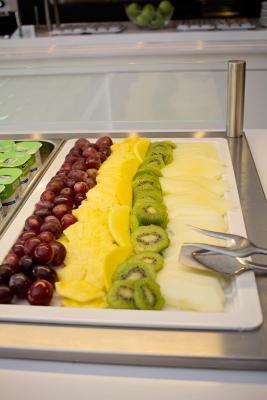 The front desk was nice enough to have the breakfast open by 4:15am as we had to take the shuttle at 4:35am. The hotel was about a 15 mins walk from the airport; I wish I knew that we could have taken the shuttle for 3 Euros per person to the hotel. The metro is very convenient that took us directly to Porto. 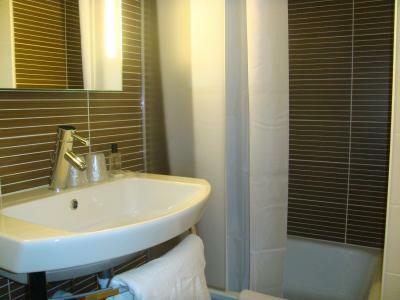 10 minutes walking distance to the airport and to the car rentals. Very convenient if you have an early morning flight from OPO and also need to drop off a rental car. They have a shuttle bus to the airport for the very early flights at 2 Euros per person, but we found it unnecessary since the airport is literally across the street. The shuttle might be convenient though for the elderly and people with heavy luggage. We arrived at 2am something. Hotel staff was helped perfectly. Even they helped us to find another hotel in the city center and also offered us to say as long as we want . 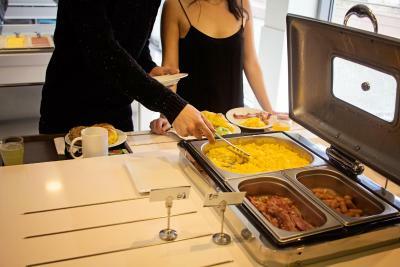 Hotel was clean breakfast was nice. Hotel staff was perfectly nice. I want also thank them again. 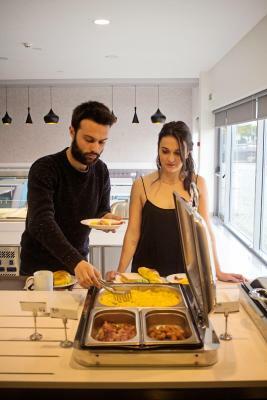 Park Hotel Porto Aeroporto This rating is a reflection of how the property compares to the industry standard when it comes to price, facilities and services available. It's based on a self-evaluation by the property. Use this rating to help choose your stay! 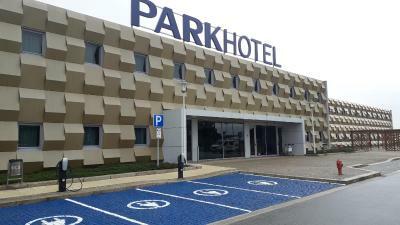 Park Hotel Porto Aeroporto is located within a 3-minute walk of Francisco Sá Carneiro International Airport in Porto. 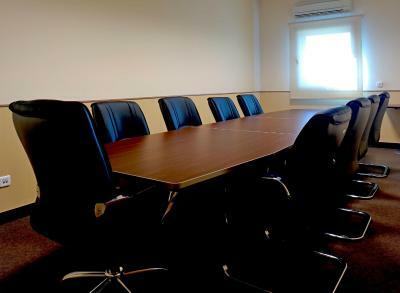 It features soundproofed rooms with free Wi-Fi and a 24-hour reception. 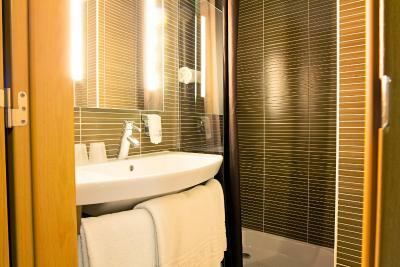 All rooms at the Hotel Porto Aeroporto are air-conditioned and decorated with warm tones. 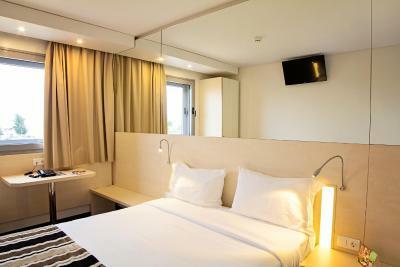 Each comes with a flat-screen cable TV and a spacious bathroom. 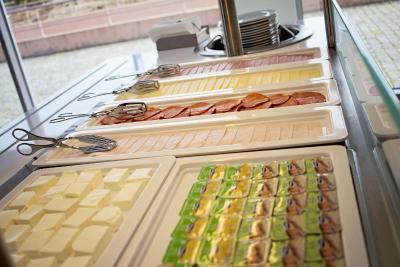 A buffet-style breakfast is served every morning at the hotel. 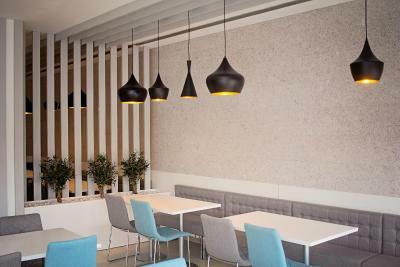 Park Hotel Porto has a restaurant open for dinner, from 19:00 to 23:00, serving regional food. 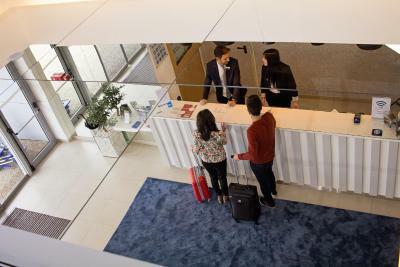 Front desk staff are available throughout the day and can assist with luggage storage, photocopying, concierge services, or help to organize a shuttle service to the Francisco Sá Carneiro Airport. Private parking is available on site at extra charge. 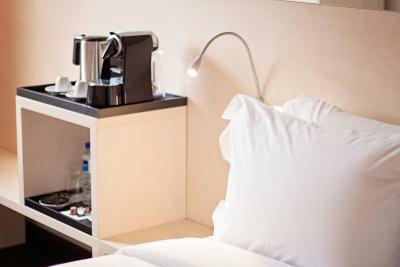 Park Hotel Porto Aeroporto is located within a 2-minute walk of 2 metro stations, the Botica and Aeroporto, providing easy access to the city center. The city centers of Maia and Porto are just a few minutes away. This property also has one of the top-rated locations in Maia! Guests are happier about it compared to other properties in the area. 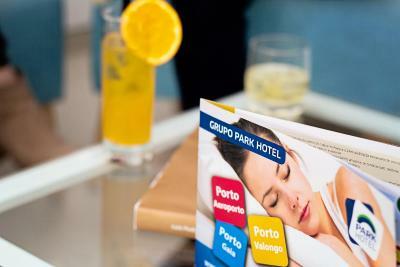 When would you like to stay at Park Hotel Porto Aeroporto? This room has a queen bed and is decorated with warm colors and classic furniture. 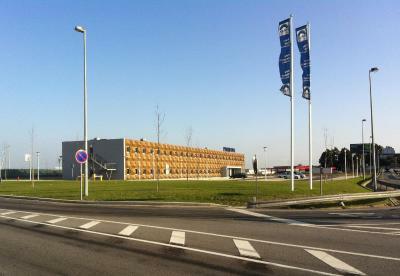 Public parking is available on site (reservation is not possible) and costs EUR 6.50 per day. This room has 2 single beds and is decorated with warm colors and classic furniture. 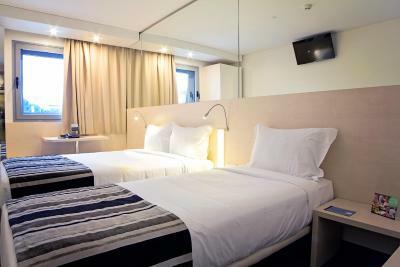 This double room features air conditioning, soundproofing and dining area. 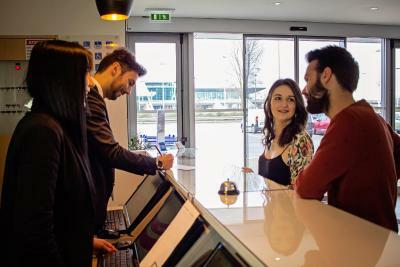 House Rules Park Hotel Porto Aeroporto takes special requests – add in the next step! 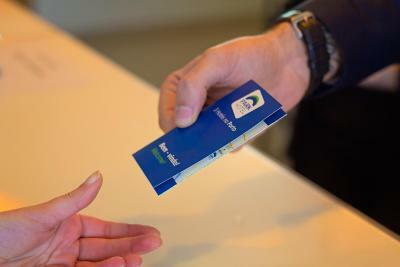 Park Hotel Porto Aeroporto accepts these cards and reserves the right to temporarily hold an amount prior to arrival. 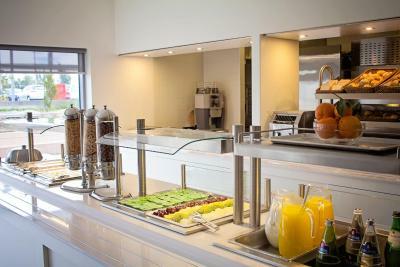 Breakfast is served every morning between 04:40 and 11:00. 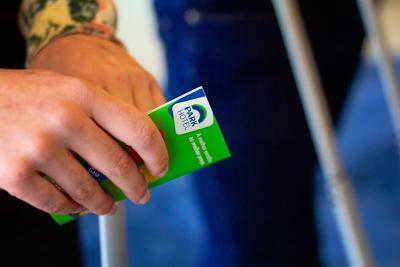 The friendliness and helpfulness of the staff. It was almost in airport and still we didn´t hear any noise. Clean room and quick service. The location is perfect for an early morning flight. Very minor, but no ‘do not disturb’ signs in room and no spare pillows. 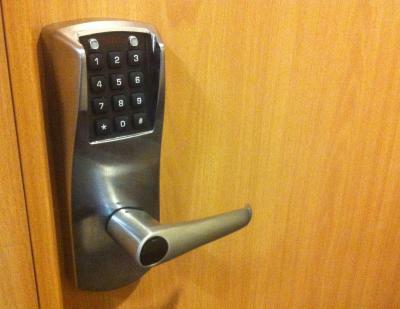 I’m sure if I’d have asked at reception, it would have been sorted. 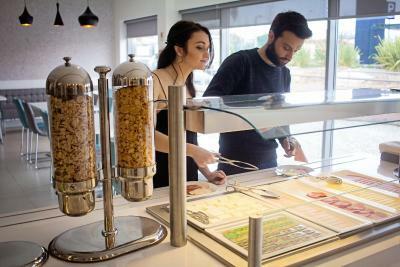 Great location, extremely clean, very pleasant and helpful staff. 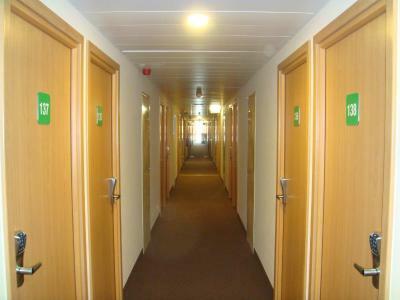 other guests making lots of noise in corridor but was silent once they were in their room. We would however definitely stay there again. Great for airport stop over. 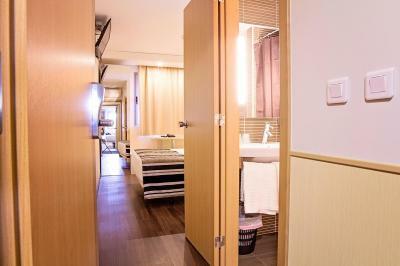 Triple room perfect for two adults and teenager.